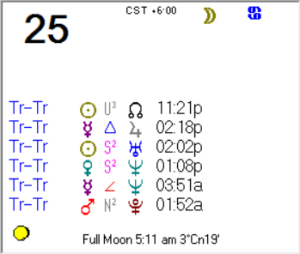 Full Moon on Christmas Day with Mercury Trine Jupiter and Uranus Direct Station. Expect the unexpected. Surprises will be surprising even to those who give them. Did you include the batteries? December 24, 2015 at 10:57 pm | Posted in 2015, 2015-Lunations, Astrology, Holidays, Lunations | Comments Off on * CAN – CAP Christmas FULL MOON, and URANUS Turnaround (both Dec 25): Home for Christmas? What’s Coming Down the Chimney? A FULL MOON on Christmas Day?! YES! In Native American cultures, December’s Full Moon that is near the Summer Solstice – thus travelling a high path through the sky – was known as the Full ’Long Nights’ Moon or Full ’Cold’ Moon. This year, we have a domicile Full ’Long Nights’ Moon near its southernmost ecliptical latitude (-5,84 degrees), below the star called ’Propus’ (eta Geminorum). December 24, 2015 at 4:10 pm | Posted in 2015, 2015-Lunations, Astrology, Holidays, Lunations, Weekends | Comments Off on Christmas Full Moon! – The 11:11 Christmas Special! 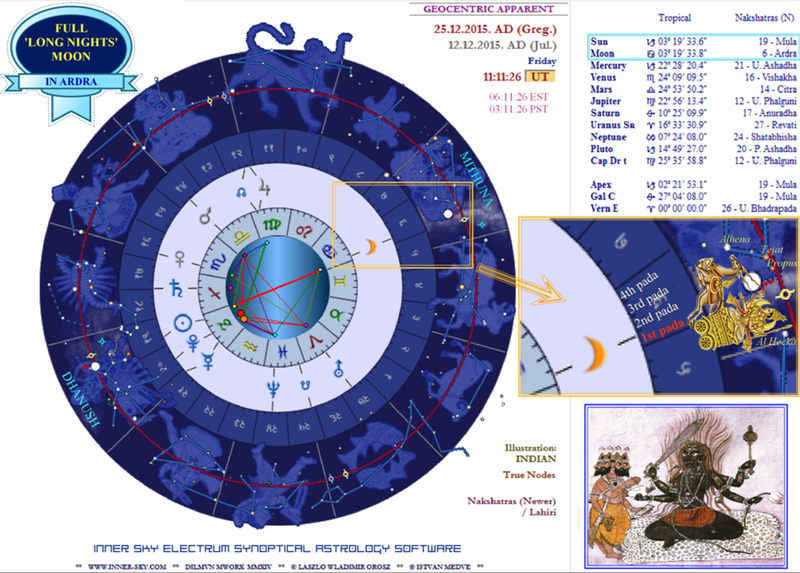 Well, Christmas Day represents more than the birth of Jesus, it also represents a special time in the path of our Sun. Having ‘died’ at the solstice, it is reborn and becomes stronger on or around the 25th, like a resurrection. With the time of 11:11, that is regarded by different groups as being symbolic to angelic codes, messages and awakening. Merry Christmas! Surprise! Not since 1977 have we experienced a Full Moon on Christmas Day. At 4:13a MST December 25th, the Moon will be at 03 degrees of Cancer 20′, bringing family, nurturance and caring to the fore! How appropriate. Since Cancer is the cardinal water sign, representing water, this sign is highly sensitive so watch out for hurt feelings if the communication isn’t entirely clear or timely! BE aware of your tone of voice, body language and words. Come from the heart and love as best you can, always and in all ways. Family is the heart of this season despite what is going on in the media and world events. BE the change you want to see! I believe Mahatma Ghandi said this. BE heart, BE love, and BE true to you!